Combine racing video games with air guitar and you've got Kinect Joy Ride, a game that just might be the closest we get to a Wii Sports of the Kinect launch. Kinect Joy Ride is a simplified racing game, the first in the genre for Microsoft's Xbox 360 Kinect sensor. You have little control of your car's acceleration and deceleration. Instead, you stand in front of your TV, pretend you're holding a steering wheel, and twist, turn and turbo boost through race tracks and stunt challenges — trying not to throw your back out. Broadly, anyone who likes racing games, from the Need for Speed fan to the lapsed Pole Position addict, as long as they're curious what the world's first controller-free racing game plays like and don't mind simplified controls. Also, people who want a Kinect game that can be reliably ridiculous fun at parties. Microsoft, which debuted Kinect to the press in June of 2009 with a controller-free racing game, is launching with this one and has their acclaimed Forza racing team on a Kinect project as well. That makes Joy Ride merely the first public test of a racing genre that will clearly see more titles on Kinect. This is an experiment that will exert influence. Does it work? Can you really have a decent racing game that has you pretending to turn an imaginary steering wheel? Stand back, say, 6 1/2 feet from your TV and the Kinect sensor, as I did, and the Kinect really can read your hand movements. It does feel goofy at first to steer with nothing in your hands, but the sensor has little trouble detecting your gestures and turning the car the right way. So, yes, it works. Simple controls may be fine, but what kind of depth does this game have? You can play Joy Ride solo, co-op or online. I mostly played it on my own. I earned points by competing well in races against computer opponents, races involving Mario-Kart-style weapons, a demolition derby of sorts pitting cars against statues and a timer, a wonderful half-pipe points challenge, some drag-racing and an unusual mode that sends your car into the sky and requires you to match the poses of an avatar standing on the car's …. wings. That's a full game's worth of content. I got points for making this pose in front of Joy Ride, during a pose-matching challenge. Leaning way back or forward to make your car flip also makes you look silly, in a good way, captured by the Kinect's camera for laughs. "Wonderful half-pipe challenge"? The Joy Ride half-pipe is my favorite mode of the several Kinect games I've been playing at home for the past week. You drive your car into a half-pipe and simply have to boost up and down the pipe, getting air and scoring points. You score by shooting the car into cherries, bombs and bells hovering over the edges of the half-pipe. You do tricks by bending your body every which-way, causing the car to flip and turn. This mode feels just like a classic Tony Hawk video game trick run, and I found it to be hard to resist the urge to keep replaying it, going for a higher score. But would this game be any good if it had a regular controller? Isn't the Kinect just a gimmick here? Racing games are so classic and fundamental that it's hard to imagine that video game steering wheels or even classic game controllers have kept many people from enjoying the genre. Joy Ride might be the equivalent of a new word for spaghetti. The old one's fine. Driving in Joy Ride would be as easy or even easier if I could sit and steer with a controller or wheel, options not supported by the game. The Kinect advance here is mapping the tricks — the car's airborne flips and spins — to leans of your body instead of arcane button combos. That may be friendlier to a wider audience, but it comes at the cost of some Kinect annoyances here, such as an unreliable gesture-based menu system and that lack of reverse. This relegates the game to being an interesting experiment, rather than a genre great. How's the multiplayer? Local co-op is delightful, if you have enough room for two people to stand next to each other racing and posing. The player who stands closest to the Kinect has lead control of the menus. You usually play in vertically-divided splitscreen. Joy Ride is often snapping photos of you as you play. You see the shots after you complete a race or challenge. They are always absurd — most wonderfully absurd after co-op. The back of the box says this game has "object scanning." What's up with that? You can try to paint your car with any color you see in the real world by holding an object of that color up to the Kinect sensor. In theory. Perhaps you have to have laboratory lighting to get the colors to match. Otherwise, it's a guess and a not very useful feature. Kinect Joy Ride is not your Gran Turismo killer nor your Forza replacement. It's a simplified racing game that sacrifices as many sacred cows as Wii Sports Tennis. But while the Wii launch game was a streamlined successful transformation of a genre that hadn't been huge in games since Pong, Joy Ride is, at best and at worst, as fun as it is unnecessary. Half-pipe makes this game one to get for parties if you are already committed to a Kinect, but otherwise this is a low-priority racing game in a genre packed with even bigger, more fully-functional competitors. 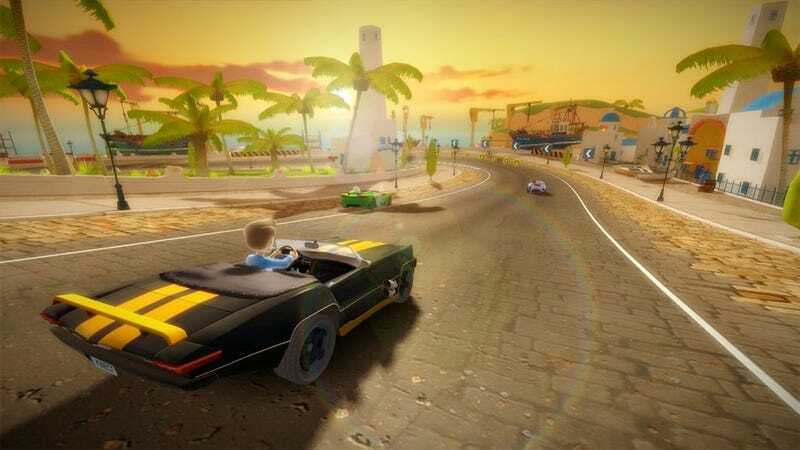 Kinect Joy Ride was developed by BigPark and published by Microsoft Game Studios for the Xbox 360, released on November 4th. Requires the Kinect sensor. Retails for $49.99. A copy of the game was given to us by the publisher for reviewing purposes. Played through each of the game's modes solo (standing in front of my couch about 6 1/2 feet from my TV), unlocking most of the courses in each, tried local co-op in several modes (with Kinect and TV turned to allow more room). Almost threw my back out on the half-pipe trying to flip the car a few more times.